The symbol for this product type is All Liquids - Yellow Triangle. The symbol for this product type is Bulk - Blue Diamond. Nature's Absorbent! 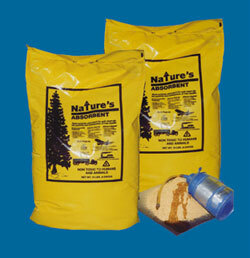 - Dry-All wood fibre sweeps away messy spills in minutes. Pound for pound, Dry-All Fibre is four times more effective than clay products. 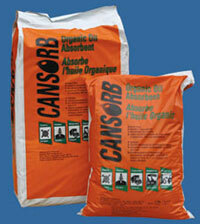 Excellent as a floor sweeping compound, reusable and will not support combustion. This product also helps to absorb odours, is non-hazardous, and is environmentally safe. Packaged in easy-to-handle 10 lb. bags to reduce back strain. Read more about Integrity's Dry-All Wood Fibre. Peat is an all organic hydrocarbon absorbent, manufactured from high quality large fibre Sphagnum Peat Moss. This manufacturing process produces a product which becomes both oleophilic, absorbing hydrocarbons and hydrophobic, repelling water. Due to its fiberous structure and our processing, peat absorbs hydrocarbons quickly on contact by virtue of its wicking capillary action and encapsulates oil on contact. This makes peat ideal for hydrocarbon clean up both on open water and land applications. Peat absorbs, on average, eight times its weight. This volume will vary based on the hydrocarbon being absorbed and the temperature.